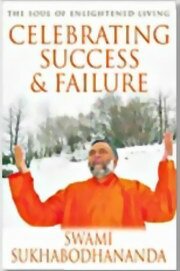 Swami Sukhabodhananda's books and his regular talks have touched many people's lives by providing them with practical techniques for day-to-day joyous living. Celebrating Success and Failure are available in English, and some in regional languages. Swami Sukhabodhananda has rich wisdom of both Oriental and Occidental teachings. In his enlightened presence the book of life unfolds itself. He guides you to evolve from a mere biological being to a spiritual being. His method of enquiry focuses on multi-dimensional aspects of life. He makes you experience inner bliss. He teaches the art of enjoying 'what is'. He makes you realize that if one door closes another door opens. Life is an opening. He is a regular invitee to various forums in India, USA, Canada, Germany and Australia. He has been addressing many gatherings at important Universities in India and abroad. Leading industrial houses invite him to conduct 'In-house workshops' for their executives. His self-development programs have benefited many in the corporate sectors of reputed institutions like banking, finance, industry and education.